Virat in Sanskrit means brilliant. Ajinkya in Sanskrit means invincible. Rarely in cricket history have protagonist names matched their virtuoso deeds as they did for four hours on Sunday, the 28’th of December 2014 at the Melbourne Cricket Ground (MCG). Two 26 year olds put on a show. They drove and they cut and they pulled and they ran. They got hit and they got sledged. They were cheered and they were booed. But for the most part they showed the world their unique gifts and the years of promise and runs that lay ahead for a fanbase and a generation that only a year ago thought the best they would ever see had retired from the sport. Two 26 year olds put on a show that was a window to the buffet that Indian fans and cricket fans can expect over the next ten years. This Australian team had won its last 10 tests at home. The attack is experienced (Over 150 tests) and was bowling with 500+ runs in the bank. India were down 0-2 in the series with little to no hope of retaining the Gavaskar-Border trophy. Never forget this backdrop if and when the partnership is either marginalized or normalized in the future. Both Virat and Ajinkya had some good fortune. Some catches went abegging and some chancy strokes escaped hands they way they would not on most days. But chancy should not be equated with flukey. Both batsmen were rarely beaten outside off and used their feet flawlessly to both spin and pace. There was also not much standing and delivering. Both ran hard and had eight threes each in addition to the 39 boundaries they combined for. An incompetent performance from the Indian bowlers over the next two days at the MCG will likely ensure India lose this test to lose control of the Border-Gavaskar trophy. Or a serendipitously sensational bowling effort ala Ajit Agarkar 2003 may help propel the team to an unforgettable win. Or Melbourne rain may choose to push the contest in to becoming that rare contemporary event – the draw! Independent of the outcome, the 262 run stand between Virat Kohli and Ajinkya Rahane on day 3 of the 2014 Boxing day test match deserves its own page in the annals of Indian cricket history. Combining their god-given talents with a disdain for the mortal feelings of fear and caution, the two 26 year olds painted masterpieces the likes of which Indian fans get to see once every ten years or so. 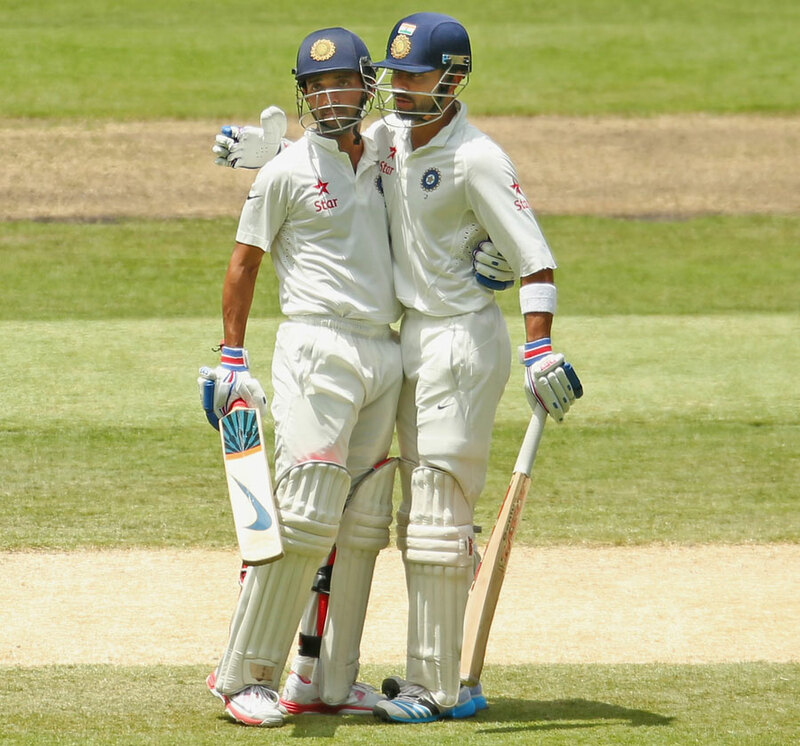 The Rahul-VVS marathons at Kolkata and Adelaide are the holy grails of Indian partnerships. They broke down great teams at the peaks of their powers. The Sachin-Azhar diptych at Capetown was a desperate and brilliant work that brought smiles and solace to a resigned fanbase. The Virat-Ajinkya collaboration probably passed these all today not just for what it did on the day but for all that it promises for the future. The long term forecast for Indian batsmanship is promising. There is brilliance in the air with a touch of invincibility.